High-resolution images discovered in the new Twitter framework of Apple's iOS 5 beta have rekindled rumors that Apple is planning to double the resolution of the iPad to 2048 x 1536 pixels. Images discovered by a person familiar with the beta release of iOS 5 have a resolution of 1536 x 2048 and have prompted further speculation that Apple will upgrade the display of the next-generation iPad, as first reported by TechUnwrapped. According to the tipster, the Twitter.framework, which is new to iOS, is the only framework to contain these larger files. Apple has built in system-wide Twitter integration to iOS 5 with an install button and login embedded within the Settings application. A separate rumor from a Taiwanese newspaper on Tuesday claimed that Apple will launch the iPad 3 in the fourth quarter with "image resolution 5-6 times higher than iPad 2," though the report remains unverified. The resolution of both the iPad and the iPad 2 is 1024 x 768. Doubling that resolution would quadruple the number of pixels, similar to the introduction of the Retina Display iPhone 4, which saw a jump from a resolution of 480 x 320 to that of 960 x 640 with a density of 326 pixels per inch. Though the original report speculatively refers to the next iPad as having a "Retina Display," doubling the resolution of the device would still fall short of the 300 ppi "sweet spot" as defined by Apple CEO Steve Jobs. According to Jobs, the "limit of the human retina" is 300 ppi at 10- to 12-inches away. It is, however, possible that Apple could repurpose the Retina Display definition for the iPad by asserting that iPads are generally held farther away from the eyes than iPhones or iPod touches. 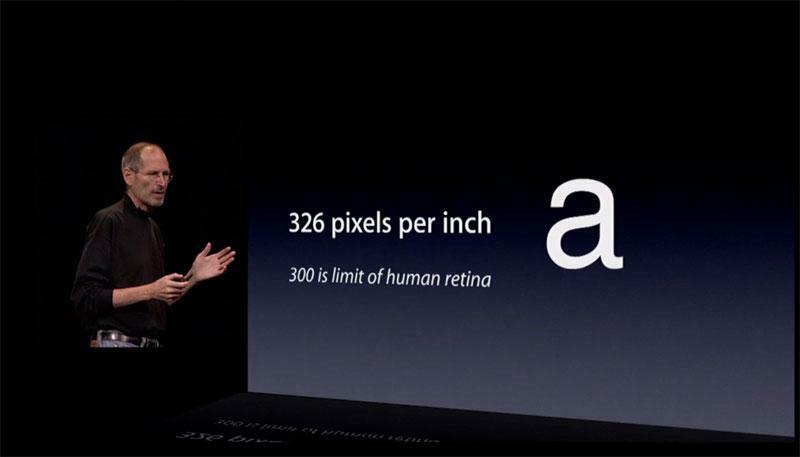 A 2048 x 1536 resolution iPad would have a pixel density of 264 ppi, while the current pixel density of the iPad is 132 ppi. Rumors of an enhanced display for the iPad have persisted since before the release of the iPad 2, with some reports suggesting that Apple planned to include a 2048 x 1536 display on the iPad 2, but ran into last-minute "engineering issues" that prevented it. Earlier this month, a rumor claimed that Apple has begun certifying parts from Taiwanese components makers. Analyst Ming-Chi Kuo with Concord Securities has asserted that Apple will deliver a double-resolution iPad 3 after resolving production volume and cost issues with the displays.